TOTALLY ACCURATE BATTLEGROUNDS SERVER HOSTING - COMING SOON!!! You can schedule everything, Rcon commands sent to your Totally Accurate Battlegrounds server including our exclusive messaging system, restarts, Steam updates and much more. The April Fools joke that became a popular game that is getting streamed by bit name on twitch. Jumping on the Battle Royal Genre like every other game nowadays this game is quite unique as it is a parody like game where everything is a joke from the movement which is ragdoll physics to the gunplay where sniper shots send you flying. 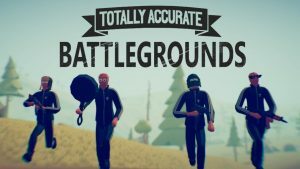 Totally Accurate Battlegrounds is a very fun and addictive game with lots of replayability, so why not get your own server and 99 of your closest friends and fight to survive and be the last man (or Woman) standing. WIll my Totally Accurate Battlegrounds server be on all of the time? Yes, your Totally Accurate Battlegrounds server will be online all of the time, 24 hours a day, seven days a week. Always on hosting is one of the key reasons to order a server from a GSP like BlackBox. Of course, you pay for one month and if for any reason you decide to cancel you simply cancel with our easy to use cancellation form. There is no obligation and no contract to keep your Totally Accurate Battlegrounds server. What if I get stuck configuring my Totally Accurate Battlegrounds server?